(WOODBURY) Brian Startare, a long time media personality in the Delaware Valley, has joined Rainbow Rabbit as part of their expansion and marketing team for their educational program throughout the area and beyond. Startare joins Rainbow Rabbit in the wake of National Bullying Prevention Month, which takes place in October. Startare, a graduate of Rowan University and the author of two books, including This Day In Philadelphia Sports (now in its third edition), is presently the public address announcer for Saint Joseph’s University men’s basketball and a sports radio and television veteran, having spent 10 years with SportsRadio 94WIP. A devoted father to two young sons, Startare recognizes the importance of programs like Rainbow Rabbit in schools. Rainbow Rabbit addresses serious issues affecting today’s children and brings about positive change. Its programs provide the tools and coping mechanisms to assist students beginning from a very young age (spanning through Kindergarten and Fourth Grade), to handle effectively difficult situations in and out of the classroom, and teaches them the virtues extolled by Rainbow Rabbit such as kindness, acceptance, tolerance, unity and inclusion. Its carefully created materials are strategically planned and readily available at the educator’s disposal. The character and story of Rainbow Rabbit was created by Arthur Vallee, a Walt Disney Company animator during the 1940s. The book focuses on a colorful rabbit, whose coat makes him unlike any other in his village. However, his exterior makes him an outcast in his community because he looks different than his fellow rabbits. The story, which which has received praise from local New Jersey educators as well as former First Lady of California, Maria Shriver, addresses the importance of unity and inclusion. With the help of educators, anti-bullying specialists and child psychologists, it was developed into an educational program to help children celebrate their differences and practice virtues of kindness, acceptance, unity and inclusion. National Bullying Prevention Month is a nationwide campaign founded in 2006 by PACER’s National Bullying Prevention Center. The purpose of the program is to unite people and communities around the world to bring awareness to the bullying epidemic, which sadly, doesn’t seem to be going away, and is still affecting children and young teenagers everywhere. During the month of October, Team Rainbow Rabbit has planned special surprises and will offer inspirational stories on account of those who have battled and survived the bullying epidemic that continues to have negative, life-changing impacts on today’s youth. After initially conducting pilot sessions in New Jersey and Pennsylvania schools, the program is making headway throughout the Tri-State area. Last year, Rainbow Rabbit was the focus of Birches Elementary School’s “Kindness Week” for the second consecutive year. Rainbow Rabbit Educational Services Corp. is an IRS-registered 501(c) non-profit organization (Federal Tax ID: 82-1643193). 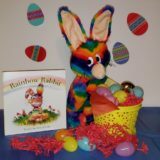 The character of Rainbow Rabbit is owned by Vallee Enterprises, LLC. To schedule interviews and for general press inquiries, television appearances and more, please contact contact Joe Vallee at 856-275-3166 or via email: [email protected].